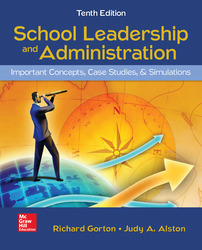 School Leadership and Administration, 10e is fundamentally a text about leadership for any situation. Primarily focused toward school leaders, School Leadership and Administration offers global application with its principles for those who may be in areas such as higher education administration, military educational training programs, agency management, and government services administration. “Window on Diversity” features in each chapter provide students the reflective opportunity to “Stop and Consider”.